Thank you! You request has been forwarded to the appropriate person and someone from the ranch will contact you soon. When you visit Turpin Meadow Ranch, you’ll do a lot more than just escape the everyday. 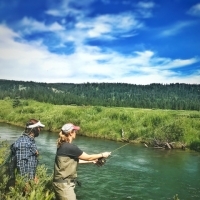 With horseback riding, overnight pack trips, fly fishing, nordic skiing, fat biking and personalized tours of Grand Teton and Yellowstone National Parks with our exceptional guides, you’ll experience a true taste of Western adventure on your trip.